Photography has definitely been my biggest hurdle with this whole blog thing. It can be frustrating and challenging and like most creative work, forever changing. Somedays I feel like I have a handle on things, and the next day I feel like I haven’t made any progress at all. It’s a learning curve and it’s definitely a bumpy ride. Good shots don’t just happen everyday, or at least not for me. We’ve moved into a new place (it’s pet friendly but more on that later!) and I’ve been really struggling with the light, or I guess I should say lack thereof. I am always seeking out inspiration and advice in the photography world, and Rachel has become a friend and teacher over the years. Her site is full of wisdom and encouragement. It seemed almost too good to be true that she was putting together a list of tips from bloggers and photographers around the globe. I think no matter who we are and where we are at, we always have something to learn. It is the reason I am so grateful to be part of this community; motivation is never far away. Keep your head up and your ambitions high. We’ll get there. In other news, I have an article over on MindBodyGreen all about what I eat in a day. There’s coffee, and cookies and – secret’s out – a lot of fudge. A little reading if you’re interested in that sort of thing or scroll down and fast forward to dessert. These, if you ask me, are the perfect treat. 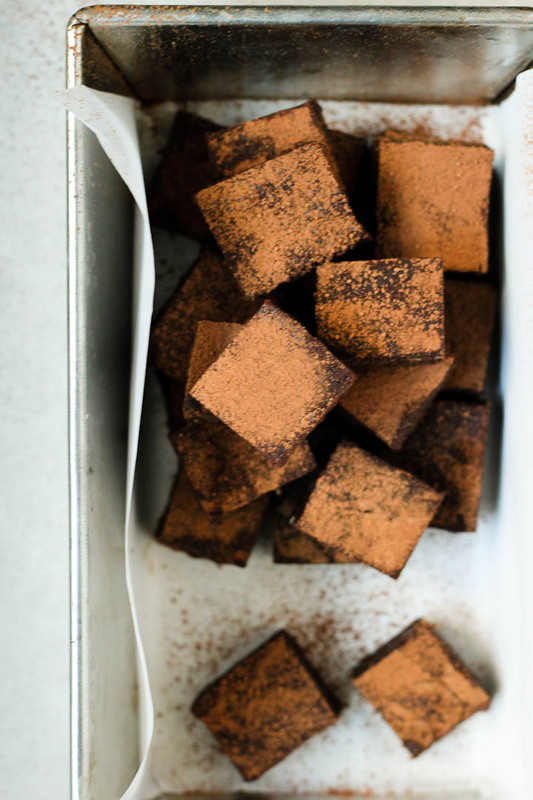 This vegan fudge is chewy, rich and satisfying. Sweet without overdoing it, a little bit of salt, and deep flavor from the dates + tahini that keep you coming back for another piece. This fudge can be easily adapted to your favorite flavors. Use any other nut butter instead of the tahini and add your own favorite notes – peppermint, orange, cacao nibs, goji berries, etc. You can’t go wrong. Chocolate + tahini are old lovers here. I do love a good reunion. If your dates seem dry, soak them in hot water 10-15 minutes before making the fudge. Drain and dry with a kitchen towel to remove any excess moisture. Dates should be soft and sticky. You can use medjools dates here if you’re fancy but my favorite everyday dates are deglet nours. Melt the coconut oil in a small saucepan over low heat, then remove and let cool. It’s important to let the coconut oil cool before making the fudge, if it’s too hot it will just make it harder to work with. Add dates to a food processor and blend until smooth. The dates will begin to form a ball in the food processor, that’s ok! Add the tahini and blend until you have a smooth paste. Add the cacao powder, coconut oil, vanilla and sea salt. Blend until combined. The mixture might once again form a ball, if it looks smooth and uniform – then it’s done! Line a square/rectangular pan or glass container with parchment. Tip the fudge dough into the container and use clean hands to spread it out. Start on one side, pressing the fudge into the corners and work until you have a flat, level surface. Use a measuring cup to pack it down and even out the top. If the oil separates a little bit it’s ok, just continue working with clean hands and get the fudge into the fridge. Allow fudge to set in the fridge for at least 2 hours, preferably overnight. Slice as desired, dust with extra cacao powder if you want. Keep in a sealed container in the fridge for up to one week. Love everything about this post, lady – the Ira quote (I LOVE HIM), your willingness to open up about your struggles with this space, and that seriously decadent fudge recipe. <3 Sending big hugs your way. omg this looks delicious!! Are the coconut oil and cacao measure in cups? I can’t wait to try this! I spend most of my time criticizing and hating my food photography, and for me, it’s been one of the biggest hurdles, too (self-assurance is the biggest hurdle of all, but that’s another topic!). I think your photography is wonderful, evocative, colorful, and always styled with perfect simplicity. Know that what *you* see is not always what we see. It’s something I tell myself, too. I can’t wait to read Rachel’s tips. Thanks for sharing! I love this so much Jodi. There isn’t a week that goes by that I don’t struggle and contemplate quitting it all. Need to get back to my roots and slow down. As creatives these feelings are inescapable, we just need to stick together and lift one another up <3 and you my lady, are as talented as they come. Always so refreshed and inspired to live life to the fullest whenever I stop by here. Adore you friend <3. I love that Ira quote, I totally just read it in his voice too <3 Some days, like today, I feel like I wasted hours of my life taking photos that will never be good enough to use. If I dare post them, I will spend the next few years cringing at the poor choice it was to do so. I love your work, Jodi. I feel that your IG has this wonderful fluidity to it that I so desperately seek in my own. I often turn to you photos for ideas and inspiration. You my friend have taste. And speaking of taste…. THIS FUDGE!! So gorg!!! I like this recipe because I don’t have to boil some of the ingredients. Most of the time, I heat it too much and it doesn’t turn out smooth and creamy. I won’t have that problem with this recipe since I only have to melt one ingredient!